Expect huge fields and door-handle banging action in Round 3 of the Power Series sponsored by Wingfield Motors at Killarney International Raceway on Saturday 13 April. 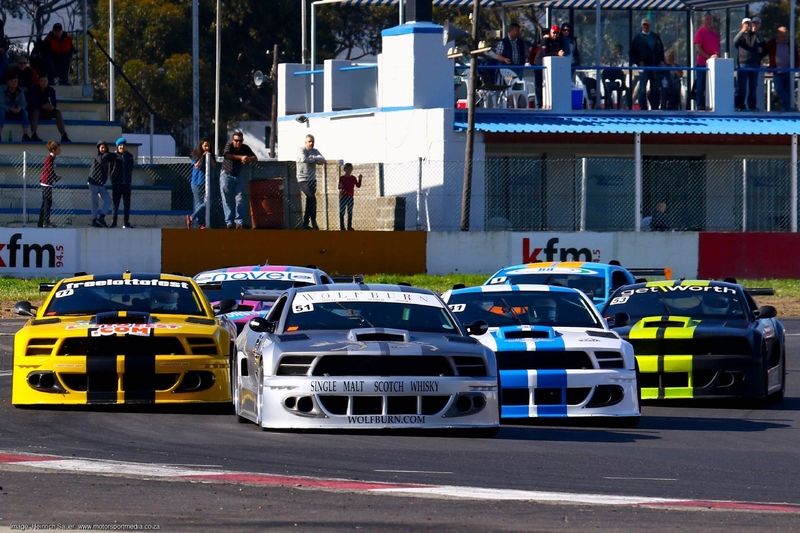 Locally-based regional racing series form the backbone of racing at the home of motorsport in the Western Cape, and the Mikes Place Clubman Saloons, in particular, look set to be deliver a high-speed traffic jam, with no fewer than 49 entries. That means the drivers at the back of the grid will form up ‘around the corner’ behind the kink leading on to the Porsche Club straight, and they won’t even be able at see the starting lights! One Clubman who knows all about the lights, however, is Danie van Niekerk; expect him to lead the charge down to Kfm Corner in the Wingfield Motors 325 E36, with Jesse Huggett (Weskaap Bakwerke Jetta 2L), Michael le Sueur (New Engineering Golf 1) and Clint Rennard (G&A Golf 2L) all over him like a rash. To get the best view of this automotive avalanche, hop on the free Hyundai Milnerton shuttle bus and make your way to the ‘Bull Bar’ grandstand for the starts of the Clubmans races – they are a sight not to be missed. With a combined entry of 30 drivers the Millstock Classic and Shatterfix Fine cars will boast the second largest field of the day, proving that old school really is cool. Arnold Lambert’s VW Jetta is likely to lead the Fine Cars from Maurizio Tascano’s VW Passat – but watch out for Mazda Rotary legend Dave Kopke and his R100 and the 6.3-litre V8 Chev De Ville of Erik Mouton. There will be more V8 thunder when the V8 masters take to the track along with the Makita Supercars. The big guns will likely be led by Fabio Tafani, Richard Schreuder, Mark Ridgway, and Brian Evans (but don’t ask us to predict their finishing order!) while Ryan McCarthy will be the men to watch in the two-litre Opel based Supercar Class. Expect to see Jurie Swart (Alpine Polo 6 2L) and Nian du Toit (Paint Chemistry Jetta 3) on the front row of the grid for the Burly Pro GTi Challenge, with Colin Meder (International Tube Polo 6R) and Jano van der Westhuizen (Wingfield/Universal Polo 6R) as their biggest threats. Marco Busi (Automan Polo) and Eden Thompson (Volkswagen Golf Mk1) are the drivers to beat in Class B, but they are likely to face a challenge from an unexpected quarter – the Class C Accelerate Golf of talented teenager Giordano Lupini, who placed finished third in Class B last time out in a car he drove for the first time in the final practice on the Friday. Steve Humble and his Harp Mallock Mk14B will be mixing it at the sharp end of the Pirelli Sports and GT field with Mike Verrier’s Aidcall 247 Shelby CanAm, Colin Plit’s Honda-powered Juno S53 and the Porsche GT2 of Johan Engelbrecht. These cars are as fast around Killarney as the top Superbikes and the racing in this class is spectacular. Grab a shuttle and watch from the Clubhouse, to see them go through the double-apex Malmesbury Sweep at upwards of 150km/h. Sean Le Riche is back with his Formula Renault, to challenge Dee-Jay Booysen’s dominance of the open-wheeler Formula Libre class in the Bidvest RM08; nobody else is likely to get close to them but the infighting among the large field of Formula Vee, Formula VW and Formula Ford drivers over the minor placings will make for fascinating racing. Race day at the home of motorsport in the Western Cape provides fun and entertainment for the whole family, with pedal karts, jungle gyms and more for petrolheads-in-training, marshalled by trained minders, at the Clubhouse Kiddies Korner. Parents of toddlers are welcome at the new nursery, where you’ll find fridges to keep juice boxes cold, nappy-changing and breastfeeding facilities, as well as toilets and wash-up facilities for running repairs. The gates open for Round 3 of the Power Series sponsored by Wingfield Motors at Killarney International Raceway at 7.30am on Saturday 13 April and racing starts at 10.00am. Book at Computicket (https://online.computicket.com/…/power_series_ro…/1287758524) or pay at the gate; entry is R80 for adults, R20 for scholars under 16 and free for kids under 12.